Getty Images/Science Photo Library Ltd. The leopard tortoise gets its name from the markings on its shell that resemble the large cat with the same name. However, consider more than just the looks of this large tortoise before deciding to care for one, as it's long-lived, requires a lot of space, and has some specific needs. The leopard tortoise is the second largest tortoise that is native to Africa (with the African spurred tortoise/sulcata tortoise being the largest). Like other tortoises, leopard tortoises are slow, quiet, and not aggressive. While a larger tortoise may mistake a finger for food, leopard tortoises are not known for biting people. They're more likely to retreat into their shells if they feel threatened. Unlike some other tortoise species, leopard tortoises aren't known to be climbers and don't burrow all that much. In the wild, males can get aggressive with other males during mating season, but in captivity, leopard tortoises are relatively docile. Leopard tortoises also do not hibernate since they are from a climate that is warm year-round; it's native to South Africa, Ethiopia, and Somalia. But their metabolism and energy level may slow down during cooler months. They're generally good-natured animals, if not the most exciting of pets. They're probably not ideal for novice owners, however, since they are somewhat high-maintenance compared to other tortoises. If you live in a cold climate, you may want to reconsider owning a leopard tortoise. These animals need hot temperatures all the time and have no tolerance for the cold. To house a leopard tortoise in your yard, its enclosure should have a place where it can hide and should be fenced-in, both to make the tortoise feel secure and to protect it from predators. Don't try to house a leopard tortoise in a place where a well-meaning dog might encounter it, because that probably won't end well for the tortoise. Make its enclosure as much like its natural habitat as possible, with alfalfa and grasses for it to graze on. Keep a shallow pan of water available for drinking, but make sure it's not positioned so the tortoise could get stuck in it. To make the tortoise feel really at home, make sure there is some bare ground in its pen; in the wild, tortoises dig in the dirt to lay eggs. Sun exposure is crucial for leopard tortoises, so make sure they have an ample basking area where they can soak up the vitamin D that is much-needed for a healthy shell. If you can't keep your tortoise outdoors year-round, be prepared to build a substantial indoor pen. It's not sufficient to keep it in a large fish tank; this animal needs room to move around. Its enclosure will need to be at least 10 feet by 10 feet, with walls at least 2 feet high. If you have a small spare room in a warm area of your home, you may want to consider converting it into a tortoise haven. But due to its size and its need for sunlight, leopard tortoises should be kept in a safe outside enclosure as much as possible. The exception is hatchlings: Since they are a tasty treat for common predators like foxes and raccoons, tortoises should be kept indoors during their first months of life. Leopard tortoises belong outdoors as much as possible, and ideally, daytime temperatures should be between 80 and 90 degrees Fahrenheit, and nighttime temperatures should not go below 65 degrees. Leopard tortoises cannot tolerate cool or damp conditions. A basking area that reaches 95 degrees Fahrenheit should be provided. If you're housing the animal indoors, take care to use heat bulbs approved for reptiles or ceramic heaters. Since a leopard tortoise housed indoors is not being exposed to direct sunlight, a UVA/UVB light is vital. This special light should be on for a 10 to 12-hour cycle daily and not filtered through glass or plastic to mimic direct sunlight. If your leopard tortoise lives mostly outdoors, you can line its enclosure with newspapers, making sure to change them frequently. But if its enclosure is primarily indoors, grass or hay are good options that give the tortoise the feel of its natural habitat. The United States banned the import of wild leopard tortoises in 2000 because many were found to be infected with a tick that causes heartwater disease. This ailment can be devastating to livestock. It is still legal to breed and own captive, domestic leopard tortoises, however. Leopard tortoises are herbivorous grazers so their ideal diet is one full of high fiber grasses and greens. Pesticide-free grass is good for grazing during warm weather and their daily diet should consist primarily of grasses such as timothy or hay. Small amounts of vegetables can be offered too. Avoid feeding a leopard tortoise anything high in oxalates, such as beet greens, swiss chard, and spinach, or fruit, which can cause digestive problems and diarrhea, leading to dehydration. Never feed it dog food, cat food, or other animal protein. These could cause damage to your leopard tortoise's kidneys. Daily calcium and vitamin D3 supplements are recommended for leopard tortoises. Pieces of cuttlebone, which can be found in the bird section of most pet stores, can also be provided for gnawing on, to promote beak health and provide extra calcium. Captive leopard tortoises are extremely susceptible to respiratory infections. These typically occur when the animal's enclosure is too humid. Another common, and painful, condition among tortoises is shell rot, caused by a fungal infection. The signs of shell rot are (as the name suggests) a dry, flaky shell that may have a foul odor. Perhaps the most serious ailment that afflicts captive leopard tortoises is metabolic bone disease. This potentially fatal condition results from an imbalance in the tortoise's phosphorous-to-calcium ratio. Metabolic bone disease causes soft, weak bones and may result in deformity to the tortoise's limbs. All of these conditions are treatable by a veterinarian who specializes in reptiles. Be sure to follow your vet's directions for care and treatment. Due to the restrictions on importing leopard tortoises, make sure you're getting one from a reputable breeder who can produce the animal's health history. A healthy tortoise has a smooth shell and clear eyes, and if you can watch it eat, you'll be able to glean a lot, because leopard tortoises are eating machines. If it's offered food and refuses it, that could be a sign the animal is unwell. With a possible lifespan of 100 years, this is an animal that could outlive you. Be sure you make arrangements for your leopard tortoise's care if you're not around, or unable to care for it. 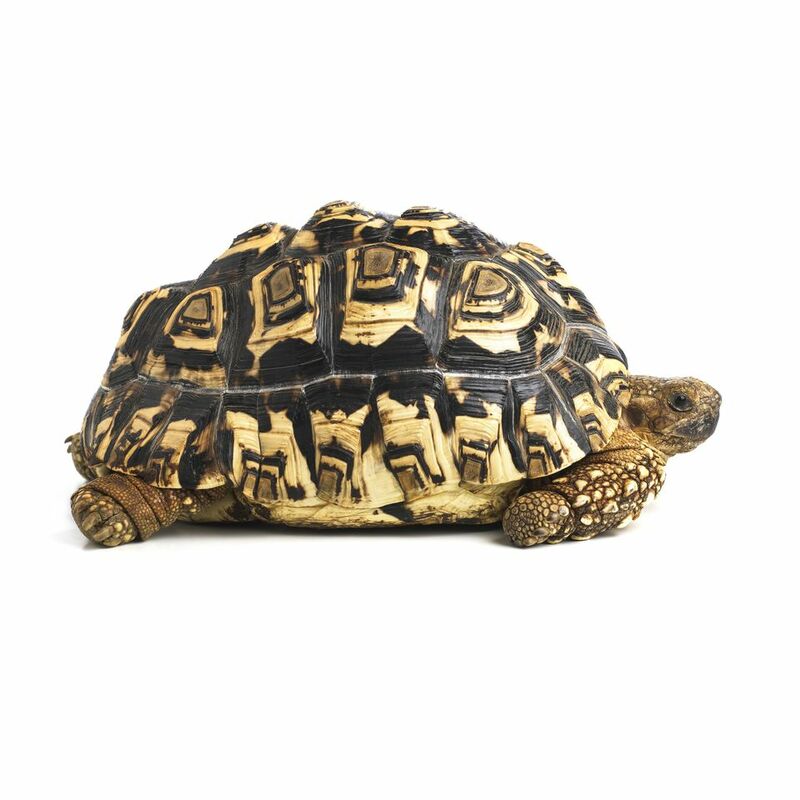 For other tortoises that might make good pets, check out our other tortoise profiles.